Built in 1946 to replace another vessel of the same name which was sunk during WW2 the Paddle Steamer Waverley is the only seagoing, passenger-carrying paddle steamer in the world and now operates passenger excursions around the British coast with the ability to carry up to 860 passengers at a time. Restored in 2003 to her original 1940s style with a high standard of gleaming varnish, brass and polished wood this magnificent old lady is one of the world’s great historic ships and is listed in the National Historic Fleet as ‘a vessel of pre-eminent national importance’. Although she operates all round the UK coast Waverley spends her summer days exploring her spiritual home – the west coast of Scotland, where she first began her seafaring career and is now one of Scotland’s best-known and most popular tourist attractions having been awarded four stars by VisitScotland and carried over 5 million passengers in total. 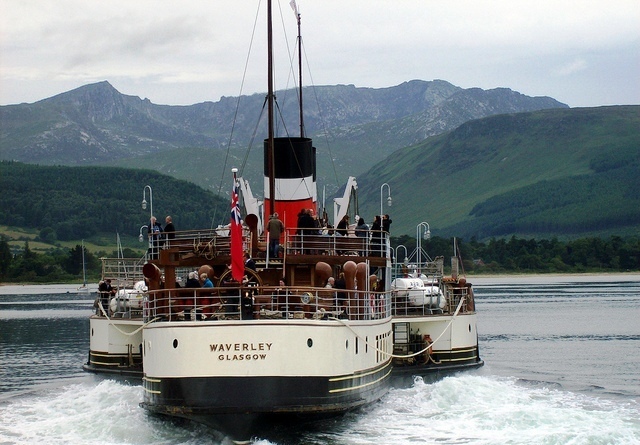 Built on the Clyde and now fully equipped to modern maritime safety standards Waverley has a dining saloon offering a selection of meals and snacks and a tearoom on the promenade deck (with the best views in the world!). 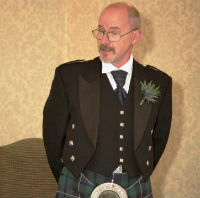 You may also wish to visit ‘Jeanie Deans’ lounge bar or the lower bar where a wide selection of refreshments can be had – there are over 30 fine malt whiskies to choose from. Next to the restaurant you will find the ship’s shop selling a range of books, videos, DVDs and other souvenirs and mementos. There is also a onboard postbox and you can send a postcard from the ship which will be franked with a Waverley stamp! The shop is run by volunteers with all proceeds going towards the continued preservation of the vessel. 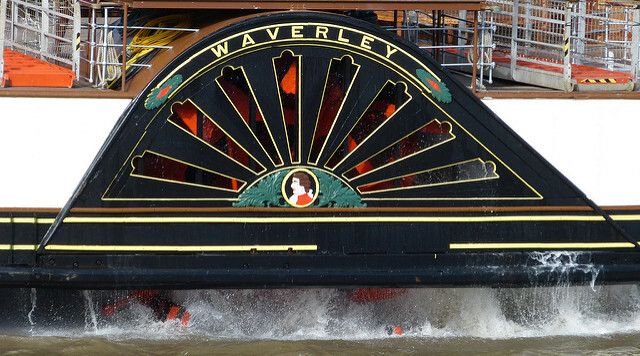 Please note that credit card payments cannot be accepted on board the Waverley. The heart of the ship is, of course, her 2100 horsepower steam engine which is open to public view via walkways on either side and you can watch as the crew keep everything under control and maintain the smooth running of the engine throughout your cruise. If they’re not too busy they will be happy to answer any questions you may have. On deck you will see the crew busy with ship’s operations and visible through portholes in the ship’s hull are the paddle wheels. Constantly churning up the water as Waverley makes her way through your cruise they can be quite hypnotic so do be careful you don’t fall overboard! 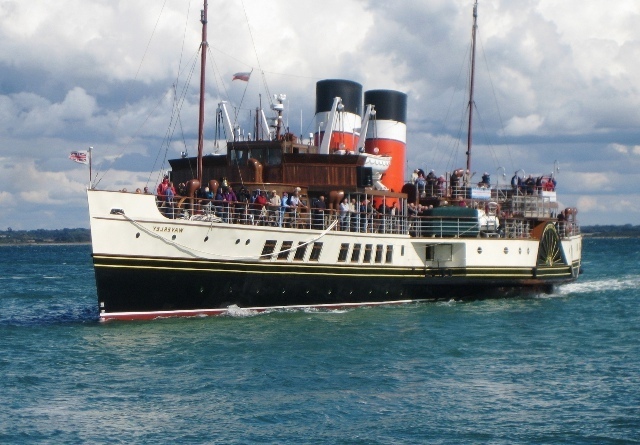 PS Waverley is well-known throughout Scotland and further afield and is even a film star having appeared in the 2011 Sherlock Holmes movie ‘A Game of Shadows’ as well as several television documentaries. Her owners claim she is ‘probably the most photographed ship in the world’!